One thing I did notice was that the Joy-Cons do seem to have shoulder buttons (more like a see-saw switch?) which double as the slide lock when docking. The twitch status on the main website doesn't seem to be working (it says offline, even though the stream is live). Is anyone else noticing this? I've used Firefox and Chrome, both the same. It could just be me but I'd figure I'll bring it up just in case. Just FYI to those reading, Gekkan-shoujo leans very heavily to comedy and doesn't have a developing story per se. It's almost entirely comedy/gag focused. Personally I prefer this style, but for those looking for plot or a more traditional story structure, it's not really there. It is however one of the funniest things I've ever read/watched, and delivers even more if you're familiar with the shoujo genre. The titular character Nozaki-kun would normally be the strong and silent type, which he is for the setups. The punchlines come from his occupation as the creator of a popular shoujo manga. His attempts to rope others into helping him, his constant note taking and observations, and his "failures" of implementing what he's learned are hilarious. 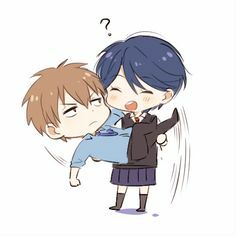 Mikorin, Kashima, Seo+"Lorelai", Hori-senpai... the cast gets pretty big but they all have their own unique comedic trait and the chemistry between all of them makes for a great comedy. The anime version of Gekkan soujo nozaki-kun has 13 episodes (here's hoping for a second season) and has good to very good production values. The VO's are great (some don't like Chiyo's but I think it's pretty cute) and the music fine, if a bit forgettable (the OP and ED however are pretty catchy). So what did everyone else think about Gekkan-shoujo nozaki-kun? Is there a particular ship that needs to set sail? For me, the SS Kashima+Hori is long overdue! RE: New Armored Core in the works! Yes! Praise the Machine Gods! @alexwhiteplays No worries, been completely swamped at work myself. I'll start on the post soon. Finally found some free time to finish it up this weekend (pacifist run). It's a great game but it really feels like SE's fingerprints are all over it. The one-time use per game items is pretty messed up and the Breach side game is pretty bland, at least for me. I know we don't have to buy microtransactions and what not, but you can't help but feel like resources were diverted away from the campaign into something designed to make more money... I get it: if my company was forking out millions to make something, I'd expect some decent ROI and mitigate risk. But still, feels bad.